Although today brought the latest GDP data (in-line with expectations) and FOMC minutes are released tomorrow, traders looking for a decisive follow-through in the US stock market—one way or the other—may have to wait until after Saturday’s trade pow-wow between President Trump and Chinese President Xi Jinping. But every news blurb about the summit’s possible outcome—or, say, random tweets from the major players—has the potential to trigger short-term fireworks. The following five-minute chart of the Nasdaq 100 (NDX) from yesterday is a good example. 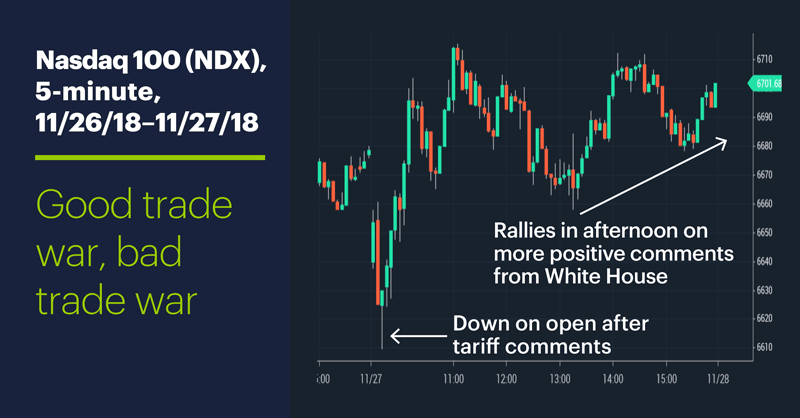 The NDX rebounded, but swung from red to green before reports emerged that, according the White House economic advisor Larry Kudlow, President Trump was open to making a deal.2 Instant enthusiasm! Right or wrong, sometimes a particular issue or theme so dominates market psychology that almost all other potential catalysts get swept under the rug, at least temporarily. Today’s numbers (all times ET): GDP (8:30 a.m.), International Trade in Goods (8:30 a.m.), Corporate Profits (8:30 a.m.), Retail Inventories (8:30 a.m.), Wholesale Inventories (8:30 a.m.), New Home Sales (10 a.m.), EIA Petroleum Status Report (10:30 a.m.). Today’s earnings: Burlington Stores (BURL), Rockwell Collins (COL), SINA (SINA), Tiffany & Co. (TIF), Weibo (WB), Guidewire Software (GWRE). 1 CNN.com. Trump dims hopes of China trade deal with fresh tariff threat on Apple phones. 11/27/18. 2 Reuters. Trump open to deal with Xi at dinner but with conditions: Kudlow. 11/27/18.